Earn Rewards Points With Every Purchase! No Tax, No Hidden Charges! Page Plus number is required to be provided in the shopping cart, and minutes will be directly loaded to the provided Page Plus number. We will be calling Page Plus IVR through an automated system. If you do not get it within 15 minutes, please contact us via email or phone so that we can check the status for you. Due to the manual nature of this product, this is not covered in our Instant Delivery Guarantee. Page Plus Cellular gives prepaid users the power of ultra-low rates in a phone that will work practically anywhere. Low prices (as low as 4 cents per min!) and great service on the CDMA national network, added to an ever-increasing feature set, make Page Plus Cellular one of the best choices for practically anyone looking for prepaid service. 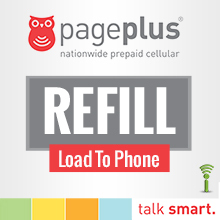 Page Plus Cellular Refill Minutes: Compatible with all Page Plus Cellular PAY AS YOU GO Prepaid Wireless plans. If you are uncertain as to what type of Page Plus Cellular Refill Minutes Plan you may have, please call our professionally trained customer service representatives toll-free at 1-877-6-Get-PIN (1-877-643-8746) from 10am to 10pm EST 7 days a week or visit our Wireless Prepaid FAQ section or Email us at [email protected]. The Page Plus Cellular® logo and the Page Plus Cellular® product images are registered trademarks of Page Plus Cellular®. CallingMart is in no way affiliated with Page Plus Cellular® or any other entity for which a logo or name may be present. CallingMart refers to these logos and or names solely for the purpose of demonstrating the products and or services that it resells. - For order inquiries, please call us at 1-877-6-Get-PIN (1-877-643-8746), Mon-Fri 9:30am-12am, Sat-Sun 10am-10pm EST. Purchase your PIN online and get it instantly as soon as you complete the order, don't even wait for the email! You may view your PIN after your have clicked "Pay Now" in PayPal. If for any reason you didn't get the instant PIN online, or the email was delayed up to 15 minutes from the time order was submitted, CallingMart will issue extra 3% of total purchases back to the credit card used in the purchase. Orders held for manual verification have some restrictions. This offer does not apply to International Top-ups/World Wireless Refills and also e-Check payments. Please see Instant Delivery FAQ for more info. CallingMart guarantees the lowest price of wireless refill PINs online. CallingMart will match any lower price from a reputable competitor website for up to 7 days from the order date. The lower priced item must be available for purchase and should be an exact item match of the purchased product from us in terms of product refill value and plan, delivery method of PIN or minutes, delivery lead time, and payment method. Marketplaces such as eBay, Amazon, Bonanza and other similar sites where prices are dictated by individual sellers and not by standard reseller pricing are not eligible. This offer does not apply to International Top-ups due to the price differences driven by the foreign currency exchange. To avail of this offer, please send an email to [email protected] with the order number and the page link of the lower priced item and a refund for the difference will be issued upon price and listing verification. Register for an account with us to start earning points on your purchases! You may redeem these reward points on your succeeding purchases at CallingMart.com saving you more, on top of our everyday discounts and special promotions! You can also earn double, triple, quadruple or even quintuple bonus points on certain occasions or when you reach our monthly volume thresholds beginning at $500. To learn more, visit CallingMart’s Rewards Program. All transactions are secured by 128bit SSL encryption to ensure security and confidentiality of customers transactions. Your information is safe with us. CallingMart.com will never share your email address or any other piece of information with any third-party.